Dennis Point Living Shoreline — BayLand Consultants & Designers, Inc. In February 2009, an economic stimulus package was enacted by Congress titled the American Recovery and Reinvestment Act of 2009 (ARRA). One purpose of the stimulus was to invest in environmental protection and other infrastructure that will provide long-term economic benefits, preserve and create jobs and promote economic recovery. The Dennis Point Homeowners’ Association (HOA) sought and obtained grant funding from the ARRA for the construction of a living shoreline project in Shady Side, Maryland. The project was expedited and close coordination with the Maryland Department of the Environment (MDE) was required to meet mandatory benchmarks for projects financed through an ARRA grant. BayLand was responsible for providing expedited permitting, design, construction procurement, construction management and inspection services. The project consisted of stabilizing approximately 1,200 feet of low marshy shoreline at two different areas along the community owned property. 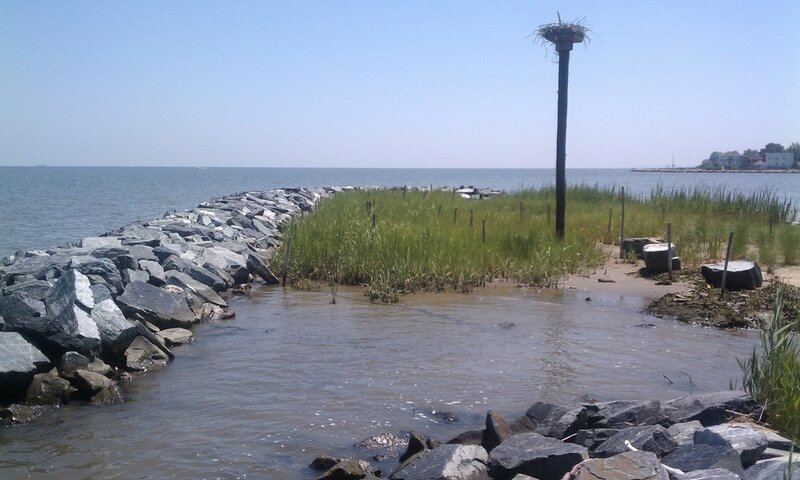 Structural elements of the living shoreline included 355 linear feet of stone sill, approximately 400 linear feet of stone breakwater, 245 linear feet of stone marsh edging and clean sand fill, marsh grass plantings and terminal groins. The construction and marsh grass plantings were completed in May 2010. The Dennis Point Living Shoreline project is excelling and its growth has only just begun.